Storms possible today; excessive heat warning in effect this afternoon – Welcome to Wyandotte Daily! 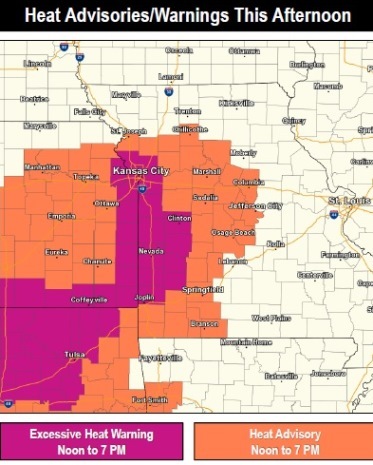 The National Weather Service said storms are possible again today, and also, there is an excessive heat warning from noon to 7 p.m. today for Wyandotte County. Storms may develop this afternoon in the region, and may quickly increase in coverage and intensity, the weather service said. The storms will move from the north to the southeast, and may produce very strong straight-line wind gusts or hail as they begin to develop southward along and southeast of a line from St. Joseph, Mo., to Davenport, Iowa. 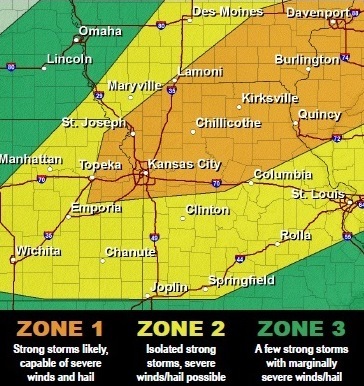 Storms may weaken or become disorganized with time, and there is a need to monitor the potential for the enhanced risk area that includes Wyandotte County, according to the weather service. The heat index could be as high as 109 today, the weather service said, with humid conditions. It is dangerous, according to the weather service. Those outdoors should take frequent breaks in the shade, drink water often, and move outdoor activities to cooler parts of the day if possible, the weather service said. 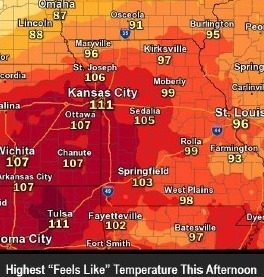 The public libraries in Kansas City, Kansas, are open until 5 p.m. today for those seeking a cooler place during the hot afternoon. Prolonged exposure to the heat and humidity may lead to heat-related illness if precautions are not taken, the weather service said. Residents should try to stay in air-conditioning, stay out of the sun, and check on relatives and neighbors, the weather service said. Young children and pets should never be left unattended in a vehicle. Car interiors may reach lethal temperatures in a matter of minutes today, according to the weather service. Today’s forecast calls for a 20 percent chance of showers and thunderstorms before 4 p.m., and a slight chance of storms after 5 p.m., the weather service said. The high will be near 95 with a heat index as high as 109. There will be a south southwest wind of 9 to 16 mph, gusting as high as 23 mph. Tonight, there is a 60 percent chance of showers and thunderstorms, mainly between 10 p.m. and 1 a.m., according to the weather service. The low will be around 66, with a northwest wind of 10 to 15 mph, becoming light and variable after midnight. Winds may gust as high as 22 mph. Between a quarter and a half-inch of rain is possible. Sunday, the forecast is mostly sunny with a high near 80, the weather service said. A northwest wind of 7 to 14 mph may gust as high as 20 mph. Sunday night, the low will be around 60, with a north northwest wind of 5 to 9 mph becoming calm after midnight, according to the weather service.